Lots of dance are typical for a region or a country. 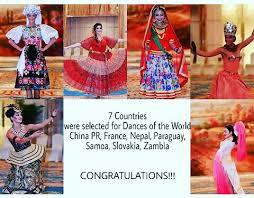 Or they are danced (almost) worldwide, but their names still remind of the region or country of origin. Most traditional and folk dances belong to this section. Like Argentina has the tango, and Brazil has the samba, almost every country has one or more typical dances founded in their history. Some of those typical and known famous dances are listed here.